The Stancato Family in Cleveland, Ohio has been serving Gourmet Italian Food since 1971. Today, three generations later, we would like to introduce to you our famous Italian Finishing Sauces. Made with the finest ingredients and a perfect blend of spices, these sauces will turn any dish gourmet. Now available for retail, you and your family can enjoy a wonderful dinner in just 10 minutes. It doesn’t get any better than this! Visit our recipe page for some great Marsala and Piccata recipes. 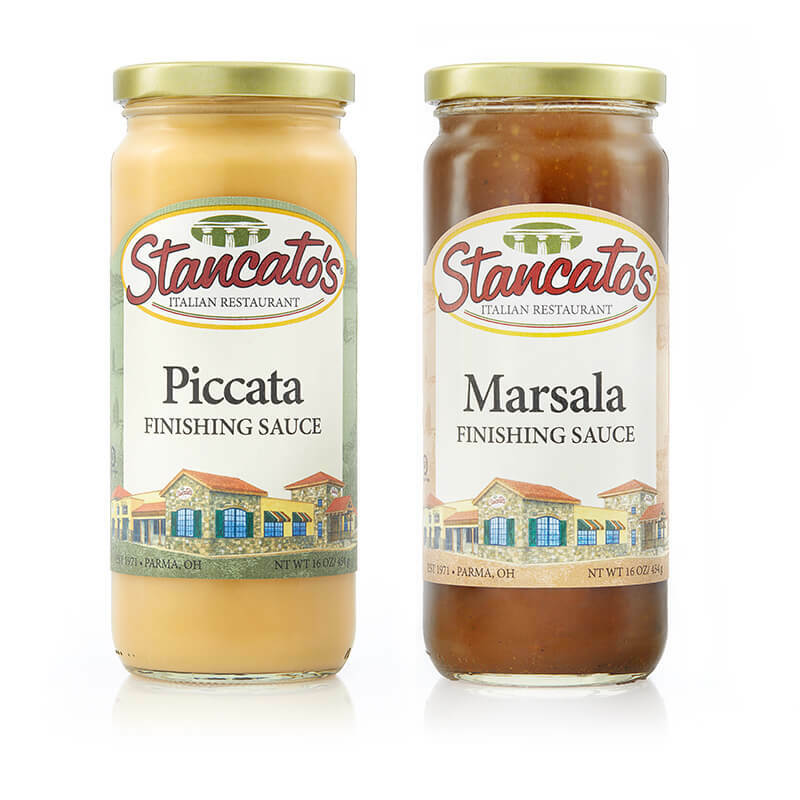 Stancato’s Finishing Sauces are products that are more than just pour over sauces. Their deep, bold, rich flavors can accompany almost any entrée. Let your imagination loose and create something special. 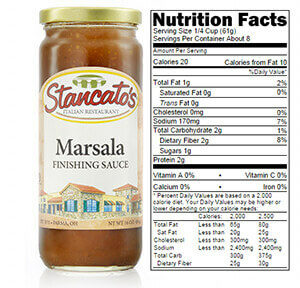 Our Marsala Sauce is the perfect blend of Marsala Wine, Beef and Pork Stock and Garlic. This savory sauce is perfect for Chicken or Veal. INGREDIENTS: Water, Marsala Wine, Food Starch, Natural Beef Flavor (beef, milk, eggs, xanthan gum), Extra Virgin Olive Oil, Salt, Natural Pork Flavor, Garlic Powder, Xanthan Gum, Spices, Parsley, Caramel Color, Onion Powder, Natural Flavor. 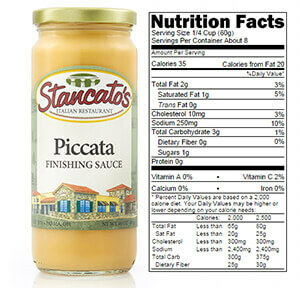 Our Piccata Sauce is the perfect blend of Fresh Squeezed Lemon, Sherry Wine, Chicken Stock and Garlic. With its buttery finish, this sauce is perfect for Chicken, Veal and Steamed Vegetables. INGREDIENTS: Water, Sherry Wine, Heavy Cream (pasteurized cream, lactic acid) Lemon Juice, Buttermilk (cultured lowfat milk, non-fat milk solids and salt), Natural Chicken Flavor (chicken. milk, eggs, salt and Xanthan gum), Modified Food Starch, Sugar, Salt, Canola Oil, Natural Flavors, Xanthan Gum and Garlic Powder.